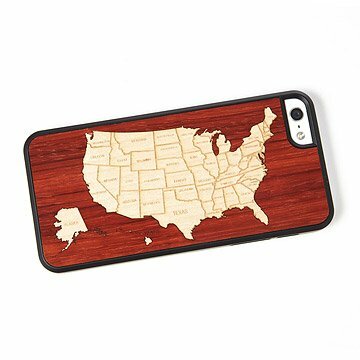 This smartphone cover displays a map of the United States made from hand-inlaid, laser-cut woods. You can discover the natural beauty of America each time you make a call with this extraordinary smart phone case made from natural wood. The map on its surface is crafted from laser-cut, hand-inlayed wood, and the rich colors are not stains or paint, but the natural appearance of each variety used. The completed panel is finished with a protective coat that helps to preserve and highlight the materials. Because of the natural nature of the materials, each piece will have variations in grain and color that make it one-of-a-kind. The panel is attached to a clear plastic case that helps to protect your phone, and keeps the screen up off of surfaces. Compatible with iPhone 4/4S, iPhone 5, and Samsung S. Made by John and Grant in Elkhart, Indiana. John and Grant started their business in 2011, both bringing passion and know-how from different areas of business and manufacturing. From the beginning, they both shared a fondness for working with something as natural and tactile as wood and shared shared great pride in producing something with their own hands. If your wood skin gets dirty, wipe with a slightly damp cloth. Our skins are finished with a protective layer that when well cared for should keep them looking great for years. Please note, the USA Map Phone Case has been discontinued. When all iPhone and Galaxy cases sell out, it will no longer be available and will be removed from the drop-down.